Purchasing a diamond ring is a daunting and confusing task for most men. They simply are not interested in buying diamonds. When the need arises, they go to the jewelry shop and simply buy anything shown by the salesperson. In this article, you will find some simple and honest advice for men who don’t have any idea about buying diamond engagement rings. 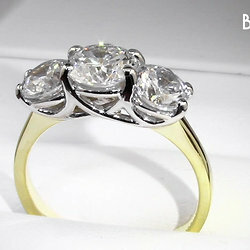 The best and safest bet is to go for a simple and sophisticated ring having a single diamond in the center. This is usually known as a solitaire diamond ring. These are the most elegant rings that every girl wants to have on her finger. However, there can be different choices. Observe for some time what your love wears. Those who wear bright color clothes and have a darker skin tone, yellow gold would be the best option for them. However, if she is a big fan of black and white clothing and has dark hairs, you should buy a white gold engagement ring for her. Size has a great impact on the money that you have to spend in buying engagement rings. A ¼ carat diamond is way too small for a solitaire engagement ring. 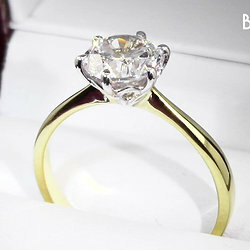 A better option would be to select a ½ carat diamond, but it is not very impressive in looks. A diamond between ¾ and 1 carat will make her happy and excited. But that might be an expensive option. If money is not a problem for you, you don’t have to look upon anything else. Price is of course important. You have to make sure that you are able to set a right balance between diamond clarity grade, diamond color grade and diamond cut grade. Important Tip: Always buy a diamond that is certified by a reputed gem lab. 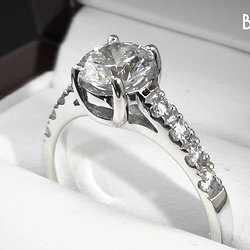 These were a few tips that will assist guys to buy correct engagement rings for their love. For further reading, you can find more articles on trusted websites.